Fuel quantity gauges are necessary so that the operator may know the quantity of fuel remaining in the tanks during operation of the aircraft. The four general types of fuel gauges are: (1) Sight glass, (2) mechanical, (3) electrical, and (4) electronic. The type of fuel gauge installation depends on the size of the aircraft and the number and location of the fuel tanks. Since the sight glass and mechanical fuel gauges are not suitable for aircraft where tanks are located an appreciable distance from the cockpit, larger aircraft use either electrical or electronic fuel quantity gauges. On some aircraft, one fuel gauge, called a totalizer, indicates the total amount of fuel remaining in all the fuel tanks. The sight glass is the simplest form of fuel quantity gauge. The indicator is a glass or plastic tube placed on the same level as the tank. It operates on the principle that a liquid seeks its own level. The tube is calibrated in gallons or has a metal scale near it. The sight glass may have a shutoff valve so that the fuel can be shut off for cleaning and for preventing loss of fuel if the tube is broken. The mechanical-type fuel quantity gauge is usually located in the tank and is known as a direct reading gauge. It has an indicator connected to a float resting on the surface of the fuel. As the fuel level changes, the float mechanically operates the indicator, thus showing the level of fuel in the tank. 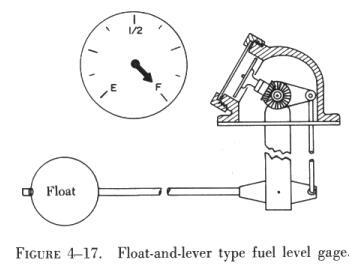 One type of mechanical fuel gauge is illustrated in figure 4-17. The electrical-type quantity gauge consists of an indicator in the cockpit and a float operated transmitter installed in the tank. As the fuel level changes, the transmitter sends an electric signal to the indicator, which shows the changing fuel level. Two important advantages of this fuel quantity gauge (and the electronic type discussed in the next paragraph) are that the indicator can be located any distance from the tank and the fuel levels of several tanks can be read on one indicator. The electronic-type (capacitance) fuel quantity gauge differs from the other types in that it has no movable devices in the fuel tank. Instead of floats and their attendant mechanical units, the dielectric qualities of fuel and air furnish a measurement of fuel quantity. Essentially, the tank transmitter is a simple electric condenser. The dielectric (or nonconducting material) of the condenser is fuel and air (vapor) above the fuel. The capacitance of the tank unit at any one time will depend on the existing proportion of fuel and vapors in the tank. The capacitance of the transmitter is compared to a reference capacitor in a rebalance-type bridge circuit. The unbalanced signal is amplified by the voltage amplifiers that drive a phase discriminating power stage. The output stage supplies power to one phase of a two phase ac motor that mechanically drives a rebalancing potentiometer and indicator pointer. The electronic type system of measuring fuel quantity is more accurate in measuring fuel level, as it measures the fuel by weight instead of in gallons. Fuel volume will vary with temperature (a gallon of gasoline weighs more when it is cold than when it is hot); thus, if it is measured in pounds instead of gallons, the measurement will be more accurate. In addition to the cockpit fuel quantity indicating system, some aircraft are provided with a means to determine the fuel quantity in each tank when the aircraft is on the ground. This is accomplished in several different ways. Some manufacturers use float operated, direct reading fuel gauges mounted in the lower surface of the wing. Another means is to use under wing bayonet gauges. There are two types in use, the drip gauge and the sight gauge. When using the drip gauge it is necessary to proceed slowly, using the trial and error method to find the exact fuel level. In large area tanks a proportionately large amount of fuel is represented by a fraction of an inch variation in fuel level. The long, hollow drip tubes require some time to drain once they are filled with fuel, and a substantial error in reading will be made if the diminishing drainage drip is mistaken for the steady drip that signifies that the tube is properly positioned. When the cap and hollow drip tube are drawn out from the lower wing surface, the fuel enters the open top of the tube when it reaches the level of the fuel. As stated previously steady drip from a drip hole signifies that the tube is properly positioned with a tiny head of fuel above the opening. The drip gauge tube may be calibrated in pounds or inches. When calibrated in inches, the reading is compared with a special chart to give a reading of fuel quantity in gallons. The sight gauge is somewhat simpler in construction than the drip gauge, and offers unmistakable visual evidence when it is properly positioned for reading. As shown in figure 4-18, the sight gauge is basically a long lucite rod, protected by a calibrated tube, which terminates at the top in an exposed quartz tip. When the tip is above the fuel it acts as a reflector. Light rays traveling up the lucite rod are deflected at right angles by the 45° surface at one side of the tip and deflected 90° again by the 45° surface at the opposite side and returned down the lucite rod. Any portion of the tip submerged in fuel will not act as a reflector. Consequently, when the fuel level is part way up the taper, a light pattern is created that is visible at the lower end of the lucite rod and that has the dimension and shape described by the intersection of the tip and the fuel. When the reflected light is reduced to the smallest perceptible point in the case of cone tipped gauges, or hairline in the case of chisel tipped gauges, the rod is properly positioned. The fuel tank quantity can be read on the tube where it emerges from the recessed guide housing. Drip gauge readings are taken at this location also. The fuel flowmeter is normally used only in multiengine aircraft. The system consists of a transmitter and an indicator. The transmitter is installed in the fuel inlet line to the engine, where it measures the rate of fuel flow. The transmitter is electrically connected to the indicator located in the cockpit. This gauge shows the rate of fuel consumption in pounds per hour. The transmitter signal may be developed by a movable vane mounted in the fuel flow path. The impact of fuel causes the vane to swing and move against the restraining force of a calibrated spring. The final position assumed by the vane represents a measure of the rate at which fuel is passing through the flowmeter and the corresponding signal to be sent to the indicator. A vane-type fuel flowmeter system is illustrated in figure 4-19. The transmitter used with turbine engines is the mass flow type having a range of 500 to 2,500 pounds per hour. It consists of two cylinders placed in the fuel stream so that the direction of fuel flow is parallel to the axes of the cylinders. (See figure 4-20.) The cylinders have small vanes in the outer periphery. The upstream cylinder, called the impeller, is driven at a constant angular velocity by the power supply. This velocity imparts an angular momentum to the fuel. The fuel then transmits this angular velocity to the turbine (the downstream cylinder), causing the turbine to rotate until a restraining spring force balances the force due to the angular momentum of the fuel. The deflection of the turbine positions a magnet in the second harmonic transmitter to a position corresponding to the fuel flow. The turbine position is transmitted to the flight station indicator by means of a selsyn system. 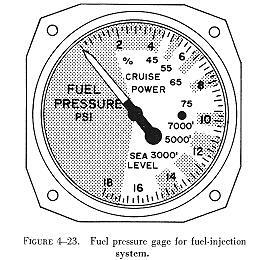 The fuel pressure gauge indicates the pressure of the fuel entering the carburetor. This gauge may be included with the oil pressure gauge and the oil temperature gauge in one casing, called the engine gauge unit. Most aircraft today have separate gauges for these functions. An engine gauge unit is shown in figure 4-21. The fuel pressure gauge is a differential pressure indicator with two connections on the back of the indicator housing. The air connection (see figure 4-22) is vented to the carburetor air inlet, and the fuel connection is attached to the fuel inlet chamber of the carburetor. fuel pump is also vented to the atmosphere, and the gauge indicates the fuel pressure resulting from the adjusted spring pressure only. In order to dampen pressure pulsations that cause pointer fluctuation, a restrictor fitting (A) is installed at the carburetor end of the fuel gauge line. (See the Y connection shown in figure 4-22.) The second restrictor (B) meters fuel to the oil system during oil dilution. The arrangement of these restrictors provides an indicated drop in fuel pressure when the oil dilution system is used. The oil dilution system will be discussed thoroughly in the Powerplant Handbook, and is mentioned at this time only because the fuel pressure indicator provides a means for a check on the operation of other fuel system units. (the synchro transmitter). As the unit turns, it causes a similar movement of a corresponding unit (the synchro motor). This receiving unit actuates the indicator on the instrument panel. These pressure and electrical arrangements make it unnecessary for combustible fuel to enter the cockpit or flight deck, thereby reducing fire risk. 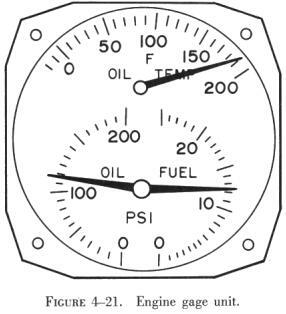 A fuel pressure gauge often used with fuel injection systems on light aircraft engines is illustrated in figure 4-23. A gauge of this type registers metered fuel pressure at the fuel injection unit distributor valve and is a direct indication of engine power output when installed in a fuel injection system for light aircraft engines. The dial of the gauge is marked to indicate percent of power. The gauge does not indicate either the engine driven pump or the boost pump pressure. In an aircraft with several tanks, there is always the possible danger of allowing the fuel supply in one tank to become exhausted before the selector valve is switched to another. To prevent this, pressure warning signals are installed in some aircraft. The complete installation, shown in figure 4-22, consists of a pressure sensitive mechanism and a warning light. The warning mechanism has both a fuel and an air connection. The connection marked "fuel" is connected to the fuel pressure line of the carburetor. The air connection is vented to either atmospheric or carburetor air inlet pressure. This arrangement prevents the warning mechanism from acting in response to changes in the absolute pressure of the fuel. If, for example, the absolute pressure of the fuel decreases because of a change in atmospheric or carburetor air inlet pressure, the change is also reflected at the warning mechanism, which then cancels the effects of the change. Normal fuel pressure against the power surface of the diaphragm holds the electrical contacts apart. When the fuel pressure drops below specified limits, the contacts close and the warning light is turned on. This alerts the operator to take whatever action is necessary to boost the fuel pressure. On large multiengine aircraft, each of the fuel crossfeed and line valves may be provided with a valve in transit indicator light. This light is on only during the time the valve is in motion and is off when movement is complete. A means for checking the temperature of the fuel in the tanks and at the engine is provided on some turbine powered aircraft. During extreme cold, especially at altitude, the gauge can be checked to determine when fuel temperatures are approaching those at which there may be danger of ice crystals forming in the fuel.